The beauty salon on The Indian Maharaja charter train. If you’re a salon owner looking for new hairdressing chairs, then you might know exactly what you need, and already chosen colours and styles. If you’re in the process of opening your own salon, or have little experience of buying salon furniture, then here’s what you need to know. 1. You’ll want to make sure that you know customers, and what they expect from your hair salon. Are your customers young professionals looking for the latest hairstyles and fashions, or older people looking for a chat and a cup of tea as much as a haircut? 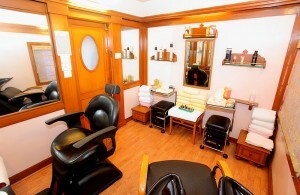 What will older people think of your modern salon furniture and hairdressing equipment? 2. What do people expect from your hairdressers based on its location? If you’re in the town centre, or in the fashionable area, they’ll expect different things to if your salon is on the outskirts of town. Your chairs will need to reflect your customers’ needs. 3. What sort of hairdressers are you? If you’re appealing to men women and children of all ages then you’ll have different requirements from your hairdressing chairs, compared to a dedicated barbers or women’s salon. 4. You’ll want to make sure that you choose hairdressing chairs in an appropriate colour. You won’t want them to be too bold, or loud, but you’ll want them to be inviting. 5. You’ll want to make sure that the style of hairdressing chairs you choose will be right for salon. You don’t want modern minimalist designs and lots of chrome, if your customers are used to a more traditional environment in your salon. 6. You’ll need to make sure that the seats are comfortable. Some customers might be spending a lot of time sat down, and they’ll need to be comfortable and relaxed so that you can cut and style their hair confidently. 7. If you specialise in cutting male or female hair, then you’ll have different requirements for your hairdressing chairs. Women are more likely to spend more time in the chair, and men are likely to be impressed by a modern design. 8. Whichever hairdressing chairs you choose, you’ll want them to be easy to use, for all your customers and staff. Perhaps hydraulic chairs will be easier for some of your staff. 9. Value for money is important, and you’ll want to make that you get salon furniture that will last, and be up to the job you need it to do. 10. Although you might be tempted to go for the cheapest hairdressing chairs, it’s important to make sure that you get what you need for your customers and staff. Now you know more about how to make sure that you have the right salon furniture, perhaps now is the time to buy new hairdressing chairs.